Gently rolling Warwickshire doesn’t strike you as the hilliest of counties as you journey through. The open plains of yellow flowering fields and shimmering, green meadows stretch on endlessly, only broken by flanks of trees along their edges. Yet the precision engineering of the Grand Union Canal, traversing the county, marks out the rises and fall of the landscape’s every inch, its locks acting as a meter by meter way marker for every slope the water meets. In the village of Long Itchington alone 10 locks climb in sharp succession, leading boats up to one of the highest points on the whole canal. It’s just a couple of miles from here that the picture perfect pastoral scene of Hilltop Hideaways is found. Aptly named, Hilltop Hideaways really does sit on a high, open crest, overlooking swathes of agricultural landscape. The views are outstanding and the sense of escape is palpable. Yet the juxtaposition of an open hilltop and being ‘hidden’ is equally fitting. The tall hedges that line the back edge of the site and the quarter-mile farm driveway that leads you away from the road, give you a sense of being cut off, while the open views to which the accommodation faces make you feel as if you’re looking out across the county, with no one there to look back at you. This is all, of course, with the exception of the Hilltop Farm farm shop, a long standing business that brings a hum of local customers eager to sample the finest Warwickshire produce. 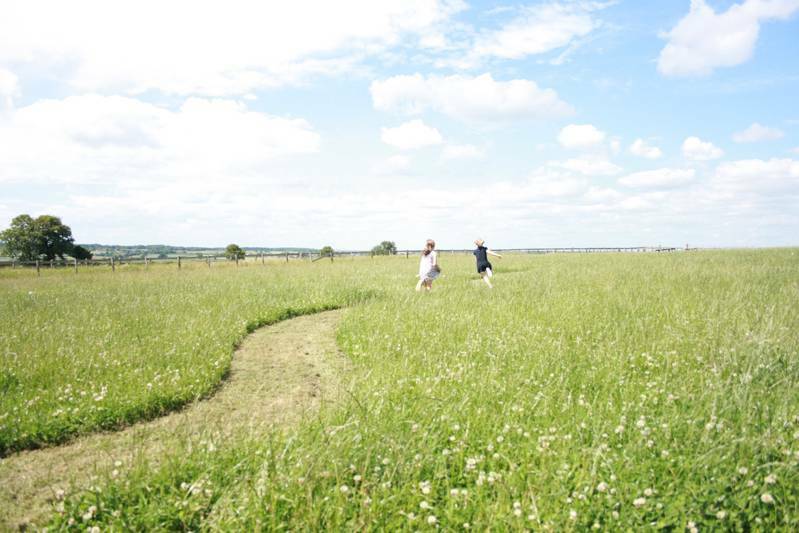 Edging the meadow where the bell tent and camping cabins lay, the farm shop has a playground and café with outdoor seating and acts as a hub for the site and a reminder of the world beyond the greens and browns of the countryside surroundings. The camping itself leaves a few options for guests to ponder. 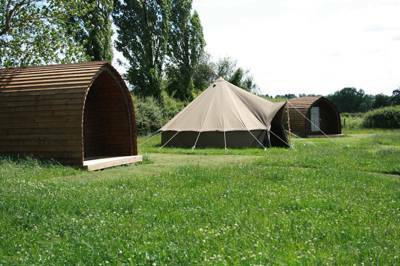 There are bell tents and wooden cabins, each with comfortable double beds and all the bed linen provided. Families are also welcome, with extra camp beds added to the spacious pads. 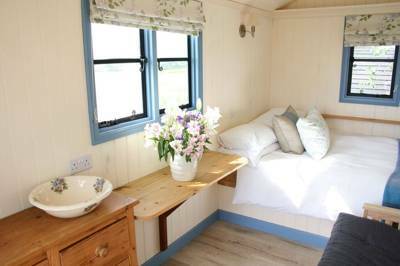 These cosy abodes also feature lighting (the cabins have electricity and the bell tents with vintage looking lanterns) and deck chairs which all adds to that classic camping feel. 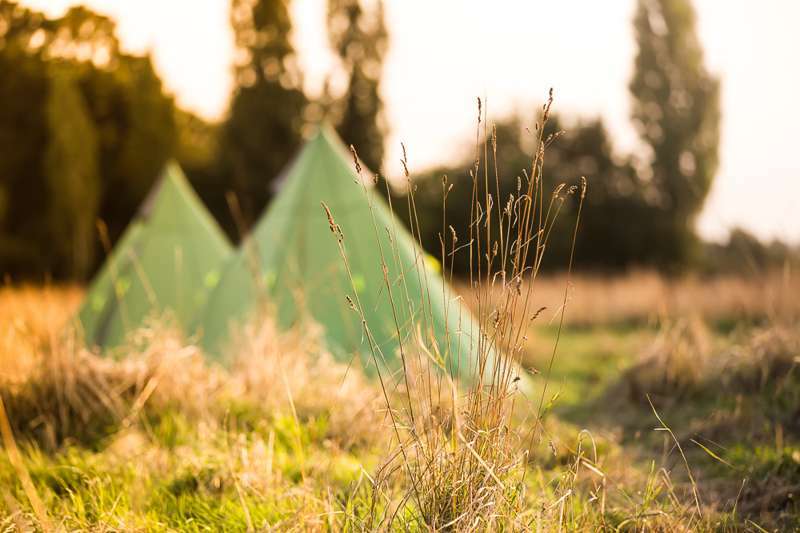 Normal tents are also welcoming in the grassy meadow, with no electrical hook-ups and an easygoing, pitch-where-you-like attitude. When you do fancy escaping back out into the real world, Royal Leamington Spa is just a few minutes in the car, a regal looking spot but with a surprisingly young and modern atmosphere, particularly during the term time of nearby Warwick University. Historic Warwick is just a couple of miles further, while Shakespeare’s Stratford-Upon-Avon is also close at hand and worth dedicating a day to for the full scope of it’s treasures. On a nice day there’s a tourist buzz about the town and a wealth of Bard-related attractions. And when you’ve had your fill of the crowds, it makes escaping back to your Hilltop Hideaway all the more perfect! Welcome to your perfect escape… Enjoy the best of the beautiful British countryside from the luxury of our cabins or canvas. Hilltop Hideaways is nestled into the rolling Warwickshire hills on a third generation family farm. We're just a few miles from Royal Leamington Spa, with Warwick, Stratford-upon-Avon and the magical Cotswolds right on our doorstep too. 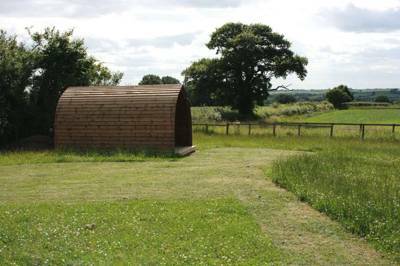 Our newly established glamping site is family-run, offering a choice of either wooden cabins or bell tents for you to stay in. For latest availability and best prices for Hilltop Hideaways, please use the Date Search above. 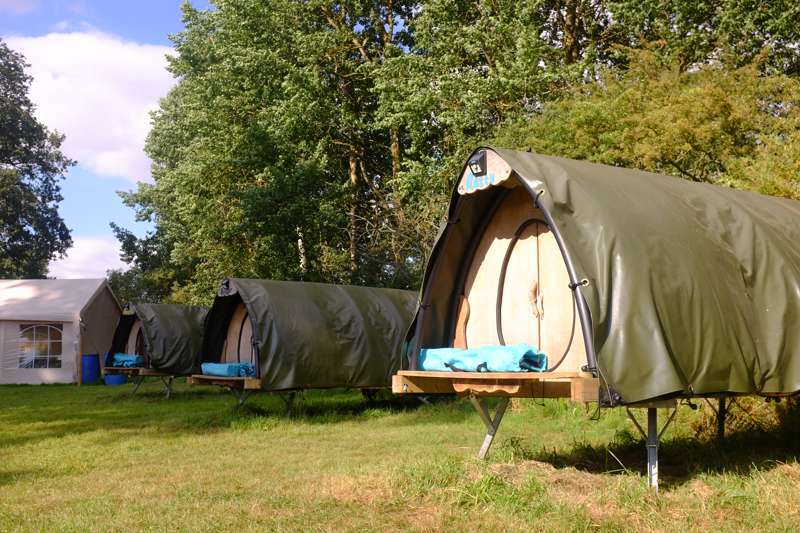 3 camping pods and 2 shepherds hut. There are modern showers, toilets and basins. 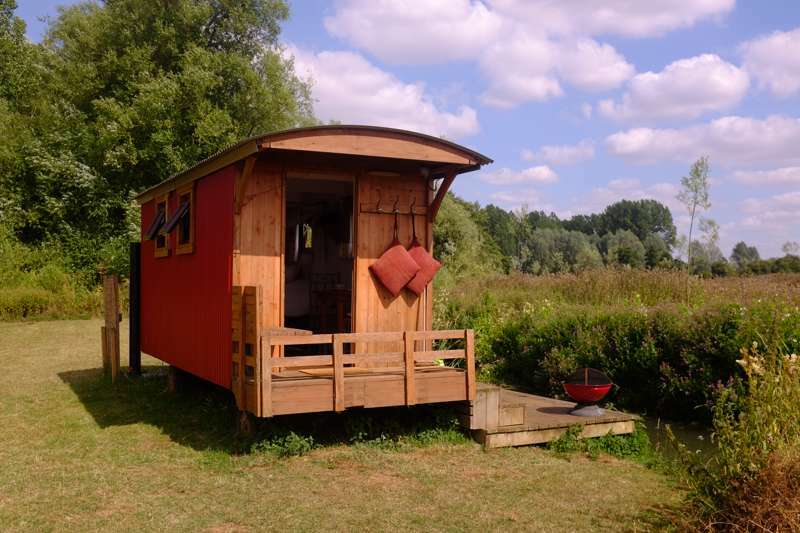 Towels and all bed linen are included for the cabins and shepherds huts, and bed linen is provided for the bell tents which feature double beds and camp beds for children. Firepits and BBQs are allowed in the designated undercover BBQ area, with picnic benches and deck chairs for use. The onsite farm shop and cafe has a great play area for children. It's just 3 miles to Royal Leamington Spa, a lively town with tall, glamorous architecture and an excellent main high street that slopes up away from the River Leam and the pretty Jefferson gardens that spread along its banks. You can drive or cycle there via the tow path on the Grand Union Canal (there's also a good greenway cycle trail to nearby Kenilworth and Kenilworth Castle (01926 852078) – a good family route). It takes roughly 10 minutes to drive to historic Warwick, home to famous Warwick Castle (08712 652000), with loads of family events throughout the year, as well as the historic town centre, worthy of a visit in itself. Shakespeare's Stratford-Upon-Avon is also just 25 minutes away. There's a fabulous onsite farm shop and café (01926 632978), which is fully licence if you fancy a little day time tipple in the sun. It's got loads of local produce for slapping straight on the BBQ – including lamb and beef from the farm. Pub-wise the nearest is The Red Lion (01926 632715; just over a mile away) in Hunningham, a fantastic spot with ceiling beams, framed pictures and a huge beer garden with river views. The Stag (01926 425801), in Offchurch, is a couple of miles away and equally pleasant. The thatched pub has an ancient feel but inside surprises you with contemporary decor and a top quality, gastro menu.